Bilaspur University Time Table 2019 has been released. Students can check the ABVV Exam Time Table from this page. Atal Bihari Vajpayee Vishwavidyalaya, Bilaspur is conducting Annual Exam 2019 from March 01 2019. The annual exam will be conducted in 3 shifts. The exam shift timing is First Shift (07 to 10 AM), Second Shift (11 AM to 02 PM), and the third shift (03 to 06 PM). The exam time, date, day, and subject can be checked from the Bilaspur University Exam Time Table. It is equally important to download the Admit Card before the annual exam. Check the page for more details about the ABVV Date sheet 2019. Candidates appearing for the university semester exam have to apply for the online and pay the exam fee within the notified date. The University releases the admit card for the eligible candidates. Candidates appearing for the exam must carry the admit card along with valid college id card. Check the table for BU Time Table 2019. How to Check Bilaspur University Time Table 2019? Bilaspur University Time Table is beneficial for the students pursuing in the university. Candidates can check Bilaspur University Time Table through the link provided above. After clicking the link candidates can check the timetable. Follow the steps can get ABVV Time Table 2018-19. 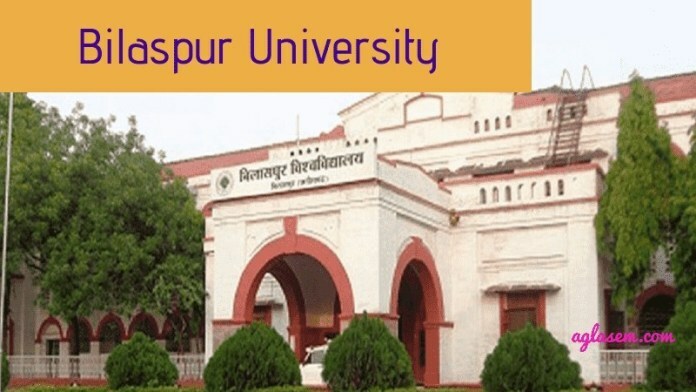 Bilaspur University has released the previous year question paper at official website i.e., www.bilaspuruniversity.ac.in or we also provided the direct link for the same where candidates can download the question papers for their easiness. Candidates can get the previous year question papers for various courses. Previous Year Question Paper: Click here to download the Bilaspur University Previous Year Question, Paper. Bilaspur University releases the admit card for eligible students. The university releases the admit card so that candidates can appear for the exam and it is the proof that the student is eligible to write the exam. Students have to carry their admit card along with the valid id proof on the day of each exam. If the student appears to the exam hall without the admit card then he/she shall not be allowed to write the exam. The students can check the ABVV Admit Card for the exam centre and exam dates. The admit card will be verified by the examiner in the exam hall and after the satisfaction, the students shall be allowed to write the exam.B.Sc. & PGDRS Experimental Examination Timetable and also date and exam centers of CCY, DYS, PGDYO Subject Regional Center Kanpur.